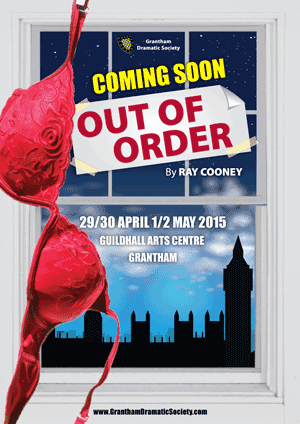 Our next production is 'Out Of Order', a hilarious farce by Ray Cooney. Casting readings are on Tuesday 13th & Thursday 15th January, 7.30pm, at our rehearsal rooms. How to find us. Please come along if you are interested in any aspect of the production. There are ten parts available in the play, with a variety of ages and a good mix of male and female roles. All are welcome. Fundraising at our recent production of Blackadder Goes Forth has raised more than £450 for The Poppy Appeal. Sales of remembrance poppies and other poppy products, plus proceeds from a raffle and donations by audience members totted up to £450.10. 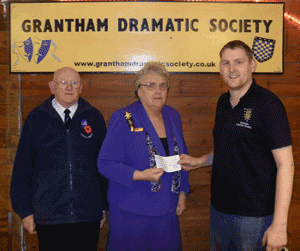 Chairperson Paul Meakin presented a cheque to John and Grace Knightall, local representatives of the Royal British Legion. Remembrance has been a hugely important part of the production and we decided early on to try and raise as much as possible for the Poppy Appeal. We’ve been selling poppies and poppy products at rehearsals and in the theatre as well as donating all the proceeds of our raffle. It was amazing to see people coming out of the performance and adding their donations to the collection, and we’d like to thank them for their support. Mr and Mrs Knightall were also extremely helpful, supplying the poppy petals used in the show, and we'd like to thank them for all their help.